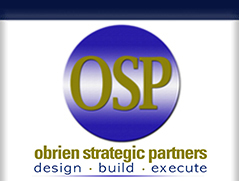 Bob O'Brien - Bob is the Founder and Principal of OSP. He has over 30 years experience in sales, sales management, technology and insurance. He has held sales leadership positions at Crawford & Company, Willis, HRH, Hobbs Group, ExecuTrain, Lotus Development and Tektronix. His sales programs have helped companies triple new business sales through a disciplined and unified approach leveraging client relationships, sales successes, sales education, recognition and associated sales and client events. Andrea O'Brien - Andrea is Executive Director of Human Resources and Administration and Vice President of OSP. She is also the Administrator at the law firm of Hall, Arbery & Gilligan which specializes in employment law. She has over 30 years of experience in human resources, payroll, billing, employee benefits and general office management. She has held various positions in the legal profession at Ostmark, Reinhardt & Benedict, Chaplowe & Chaplowe, Town of Fairfield, CT Probate Court and Casey Gilson P.C. She has also served as the Clerk for Town of Fairfield, CT Historic Commission and worked with Fairfield Conversation and Parks Commission. Manard Warren - Manard Warren is the Executive Director for Sales Training for OSP, and founder and President of Manard Warren & Associates. Manard has spent more than 17 years traveling throughout the country teaching professionals in all fields how to overcome the emotional barriers that often keep them from reaching the goals and success they dream of achieving. Manard coaches and counsels companies, not only to increase salesperson productivity, but also in the assessment, selection and retention process. Manard Warren & Associates is recognized as one of the nation's foremost experts in Sales Call Reluctance® training and increasing salesperson productivity. Randy Schwantz - Randy Schwantz is Executive Director of Sales Process Engineering at OSP and President of The Wedge Group. He is a Strategic Coach, Leading Innovator, International Best Selling Author and an Engaging Motivational Speaker. As one of the most talked about sales trainers in the commercial insurance industry, Randy Schwantz, for almost two decades, has worked with the top insurance agencies and carriers. When traditional sales training methods failed, Schwantz identified the "hidden obstacle" preventing producers from winning - the Incumbent. From this he created a powerful step-by-step process called The Wedge Sales Process, teaching producers how to bust incumbent relationships and win more new business fast. He has taken everything he has learned and turned it into a remarkable, innovative new system to deliver his powerful process, used by the top agencies in the world, to agencies of all sizes who are sincere, committed, driven and have an intense desire to be a part of something bigger... part of an extraordinary growth network iWin™, Wedge Integration Network. In 1996, Schwantz delivered The Wedge®, a selling process to bust incumbent relationships. In 2002, Schwantz delivered The Wedge Sales Culture™, a system to change the culture of an agency - from great service only, to great service with high SALES GROWTH. In 2010, Schwantz has a new innovation iWin™, that integrates all his processes, creating accessibility for large and small agencies to have the BEST resource available to grow their firm. "Technology has come a long way in just the last five years. Everyone has good internet speed, enabling us to provide ongoing training 24/7, database tools that only 5 years ago were too expensive to build, and now we've been able to take the best of every category, integrating it into one package we call iWin™." Alan Blume - Alan is Executive Director of Lead Generation and Client Retention Programs for OSP. Alan graduated from Northeastern University in 1980 and was awarded a Northeastern University Fellowship to pursue a Masters degree in 1981. Over the ensuing two decades his career followed a path in senior sales and marketing management positions. As a software company VP of Sales & Marketing, his sales and marketing methods landed him on the prestigious INC 500 list for two consecutive years. Alan rapidly ramped up another small technology company from zero to $20 Million in a just 20 months, and has doubled or tripled the sales of numerous other small companies. 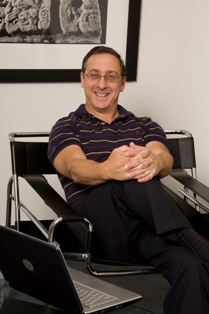 Alan has authored two books, Your Virtual Success, Finding Profitability in a Virtual World, and Sell More & Work Less. He is the CEO of StartUpSelling, Inc., a lead generation and web marketing agency. He is considered a virtual growth guru, enjoying the enviable business model and lifestyle advantages of his virtual operation. Todd Cable - is the Executive Director of Strategic Marketing for OSP and is an independent Marketing Consultant. He has more than twenty-five years of experience in marketing, sales, branding and product development. He has worked for multiple consumer information companies involved with credit, healthcare, drug testing and insurance claims, all in a business-to-business environment. Most recently he has been focused on strategic market development, vertical marketing communications, product development, emerging markets, experiential marketing and branding for companies such as CoreLogic Teletrack and Crawford & Company. Kris Hammett - Kris is the Executive Event Planner for OSP, and partner and Vice President of Account Management at The Juice Studios. Her goal is about developing successful relationships that are mutually beneficial with the goal to create a custom program that is focused on the perfect blend of creativity, service, client advocacy, fiscal accountability and overcoming challenges along the way. Her focus is problem solving, and for her it is all about solutions keeping the end result always in sight. Kris has been exceeding client expectations for the past 15 years. Her clients include: Volkswagen, Audi, Ford, JPMC, TIAA-CREF, Johnson & Johnson, Forrest Pharmaceuticals, Abbott LABS and many more. Mark Maloney - Mark is the Executive Producer for OSP, and founder/owner of MJM Productions. He has over 22 years experience successfully producing corporate communications media and live audio visual events for clients such as ADP, Coca Cola Enterprises, Kimberly Clark, HRH, McKesson Provider Technologies, and NAPA. Mark has a degree in Advertising and Marketing from the University of Georgia and has won numerous Telly Awards for corporate video production. Along with corporate communications he has also produced content for national and regional commercials as well as magazine format broadcast television shows. Nick Simonette - Nick is Executive Director of Trade Show Programs for OSP. Nick’s 20 years of experience range from carpentry and project management to account management and strategic direction. Nick has been responsible for delivering unique solutions that drive measurable results in the face to face marketing industry. Clients include GlaxoWellcome, Nike, Novartis, and Ciba Vision. Nick’s daily responsibilities include: overseeing daily operations and strategic vision of an account as well as directing the team members with regards to creative and tactical methodology's to make the program a success. Nick has a wide range of experience in the trade show industry and takes pride in providing inherently strategic solutions for his clients’ trade show and event marketing programs. Paul McKeon - Paul is the Executive Director for Team Building for OSP, and a founder and Partner at The Food Movement where he spends most of his time devising and delivering unique team building activities built around cooking and food. Now a chef, Paul spent his first career deploying professional services teams in the areas of marketing and sales. He has nearly 30 years experience in high technology marketing, primarily at Crescent Communications, the privately held marketing services firm he built--and then with Ketchum Public Relations where he served as head of the Global Technology Practice. Throughout his tenure in professional services, Paul noticed that teams with good internal chemistry and respect for each other performed far better at client engagements. Paul and his team at The Food Movement have incorporated many of the precepts of creating strong teams into a series of culinary challenges that are easy and fun for businesses of all sizes. These engaging workshops are better than golf and “ropes courses” for building great teams. Sales teams, client and account teams, product development teams and just about any group whose successful performance depends on their co-workers will find them beneficial. Of course, many who have gone through these sessions also say that the best part is simply the great meal at the end. Click here to visit The Food Movement website.